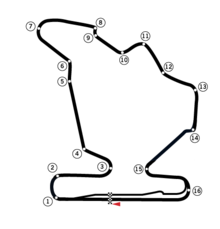 The 1995 Hungarian Grand Prix (formally the XI Marlboro Magyar Nagydij) was a Formula One motor race held on 13 August 1995 at the Hungaroring, Budapest. It was the tenth race of the 1995 Formula One season. The 77-lap race was won by Williams driver Damon Hill after he started from pole position. His teammate David Coulthard finished second and Gerhard Berger came in third for the Ferrari team. Rubens Barrichello was running 3rd before his engine died on the last corner, and he crawled to the line in 7th. The Jordan team were waiting on the pitwall for him to claim 3rd place – out of superstition following this incident, they never again went to the pitwall before a race was over. Pedro Lamy replaced Pierluigi Martini at Minardi. Taki Inoue was hit by a safety car Tatra 623 as he attempted to extinguish a fire on his Footwork, this was his second incident in this season. He suffered minor injuries. ^ "Tatra T-623". Banovsky's Car of the Day. 9 April 2015. Archived from the original on 22 April 2017. ^ "Taki Inoue - Biography". F1 Rejects. Archived from the original on July 25, 2008. Retrieved 28 May 2011. ^ "1995 Hungarian Grand Prix". formula1.com. Archived from the original on 2 November 2014. Retrieved 24 December 2015. ^ a b "Hungary 1995 - Championship • STATS F1". www.statsf1.com. Retrieved 18 March 2019.